Alexandre Grenier checks in as the 18th ranked prospect in our consensus rankings of the Canucks’ prospect pool. At the start of last season, Grenier was ranked eighth. 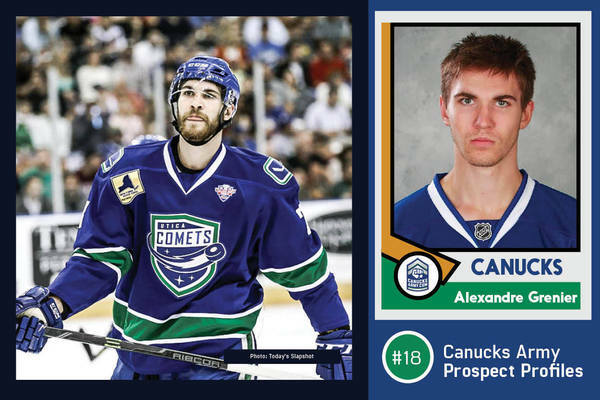 That was on the heels of a 2014-15 season which saw Grenier make significant strides as a key contributor for the Utica Comets in their Calder Cup season. Though Grenier failed to parlay that success into a full-time role at the NHL level, he continued to earn the trust of Comets head coach, Travis Green, and was dealt first line minutes with the club last season. Grenier’s year had some major up-and-down swings. He made his NHL debut in November but was almost immediately sent back down to the AHL. In January, Grenier failed to register a single point and was sitting at just 19 points in 40 AHL games. There were concerns that Grenier was moving away from the power forward style of play that saw him be so successful. Those concerns dulled, as Grenier went on to record 29 points in 29 games down the stretch, to finish the season with 48 in 69 games played. In the midst of that hot streak, Grenier received his second NHL call-up of the season and played another five games for the Canucks. He was held pointless but looked the part of an NHL player. When one takes a qualitative glance at Grenier’s game, his smarts and offensive skills jump out especially. Grenier is at his most effective when he uses his big frame to create space and provide his linemates with an outlet pass. In terms of areas he’ll need to improve upon, Canucks head coach Willie Desjardins remarked upon his needing to get quicker and improve on his play away from the puck. Another factor working against Grenier is time. He’s 24-years-old, requires waivers next season and on a one-year contract. For a player entering his prime physical years, you’d expect him to have made significant strides, but that wasn’t the case at the NHL level last season. With the additions of Loui Eriksson and Anton Rodin on the right wing, Grenier will likely be battling in camp with Brendan Gaunce and Jake Virtanen for the 13th forward spot. Should Grenier find himself in the AHL to start the year, he is less likely to be called up than both Gaunce and Virtanen due to the fact he requires waivers. Using pGPS, 15.6% of Grenier’s comparables went on to become NHL regulars. Given all of the aforementioned factors, this is likely his last shot at becoming an everyday NHL’er, especially with the Canucks. If Grenier finds himself in the AHL, he will be a solid top six forward in Utica. It is always good to have depth and have players to help the younger prospects transition to the pro game, and Grenier will help do that if he is in the AHL. Time is running out for Grenier, and it will be interesting to see if he can impress enough at training camp in September to secure a spot in the NHL. Do people really think Grenier will be claimed if he is put on waivers to be sent back to the AHL? It seems to me that there are a lot of good young players constantly being put on waivers to be sent back to minors for further developing, and that claims are rarely made unless a team’s roster is comically in complete destitute and it has roster spaces to burn to troll other teams. He might be, it all depends on the depth of the team trying to claim him. I’m certain this year we will lose guys to waivers, Benning has lined up a lot of guys in the 20-24 range fighting for NHL spots, as it should be, but its also inevitable given the age and playing time already some of these guys likely get picked up. The usual suspects will scream “asset management” (the worst and most over-used term on Canucks sites imo). But that’s how we’re going to build better team depth at this stage, by trying a lot of guys out, keeping the best performers, and letting some go. Don’t forget, we also need space on the 50 man roster for some of our picks so some have to leave anyway. The flip side of waivers this year might really benefit the Canucks tho – the Canucks are in the #3 spot for eligibility to grab players off waivers. We might be able to improve the team by letting guys like this go, and grab up other forward depth from teams like Chi that have to send guys down due to their depth and NMCs. Might I ask what the conditions are to be defined as a “prospect” in this series? Just curious. I love these profiles by the way. Keep up the good work! I know it won’t matter this year but it might be a more accurate measure of prospect potential to do something more like a 25 under 25 series like several other teams’ blogs do. I think it’s more realistic given the younger and impactful players we have who wouldn’t qualify for Calder contention — Baertschi, Horvat, Virtanen, Etem, and Hutton are among our best young players and while they’ve all established themselves as real or fringe NHL players, I just think it’s a better gauge of our prospect pipeline to include these instead of just the recent draft picks and acquisitions. He was ranked 8th and dropped to 18th. That’s quite a drop for the big guy. It also means we have more depth. He’s 6’4 and 210 lbs, so he has good size. He should use it more often. On the Canucks he fits on our 4th line right side. I doubt he takes that spot from Dorsett. As mentioned by Tyler, Alex requires waivers. The safe thing to do is start him in Utica, so there’s no risk of losing him. It also means less chance of getting called up. Alex turns 25 in 4 weeks. Time is running out for him to make an impact, and he really needs to turn it on in training camp. Having Alex as our 13th forward wouldn’t be a bad thing. I’ve got to say, I hope he tears it up and makes the team. Once they put the Canucks jersey on, I hope for the best for every one of our players and prospects. Good teams have to let go of pretty decent NHL’ers all the time, I would love the Canucks to have that sort of “problem”. I’d rather have Grenier take a step and bring that size to our forward group than add Hudler or Vermette, though I’m not opposed to either of those players. As noted earlier, throw them all in the mix and keep the best, the teams we had a few years ago with gift-wrapped roster spots didn’t get it done. Uncertainty isn’t necessarily a bad thing. Sorry what were you watching. He looked horrible. He was slow, showed no physical play, had zero scoring opportunties. Is not a NHLer – based on what we saw ladt year. He did have that break away / broken stick chance last year. What a curse! Hope he gets called up at least once or twice to get another shot at bringing home a puck. Also, is it me or is part of his height like an extra 4 inches of neck length? Good for the higher leaves I guess.